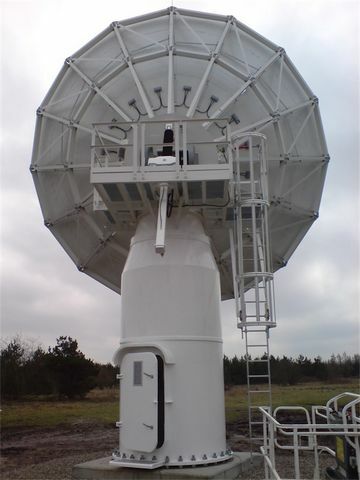 Turning Head Antennas, designed and built by VERTEX ANTENNENTECHNIK (VA), offer continuous travel ranges, high pointing/tracking accuracies, and allow for operation with all visible GEO satellites or during LEOP phases. Single band Tx/Rx, multiband Tx/Rx and multiband receive only feed systems are available for nearly all frequencies up to Ka-band. Available reflector diameters vary between 6.3 and 18.3 meter. The servo & drive and tracking system provides various operating modes; remote control is possible via serial/LAN interfaces. The standard tracking system is Orbit Prediction Tracking, optionally conventional dual channel monopulse is offered in case high accurate tracking is required like single station ranging. The standard antenna tower is a steel structure providing space for drive cabinet. Optional electrical reflector heating comprising infrared heating rods integrated into the reflector panels is available; thus the power consumption can be reduced by heating individual sectors only. VA provides turn-key ground station solutions including the entire transmit and receive electronics, modems/CRT as well as customized monitoring & control systems to sites all over the world.